CASH donations are pouring in from around the world to help the young woman who lost five family members in a devastating drowning accident in Buncrana. More than 50,000 euro has been raised in the last 48-hours to help Louise McGrotty (35) who will bury her husband, her two young sons, her mother and little sister on Thursday. All five died on Sunday in a tragedy so immense that many experienced emergency responders and clergy in the North West said it was the worst they had ever encountered. 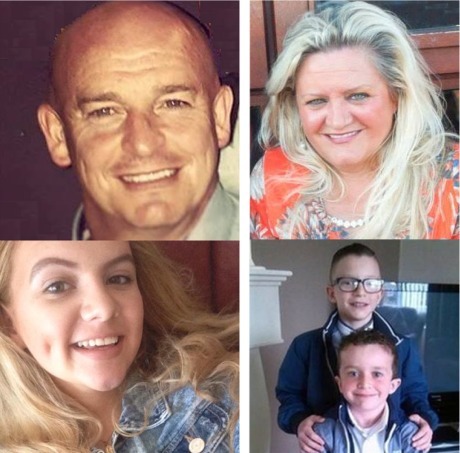 Those who died were Sean McGrotty (46); his sons Mark (12) and Evan (8); his mother-in-law, Ruth Daniels (59) and her daughter Jodie-Lee Daniels (14). The accident happened following a daytrip to the seaside when Mr McGrotty's Audi 4x4 got into difficulty on the slipway of Buncrana Pier. The large black vehicle is reported to have been quickly pulled out to sea by the force of the tidal waters at the slipway at evening high tide. Within minutes all five victims had drowned, eyewitnesses report. Sean and Louise's youngest child, four-month old baby girl, Rioghnach-Ann, was heroically saved by the actions of a passer-by. Kerrykeel footballer Davitt Walsh (29) bravely swam out to the stricken family as their SUV became submerged in the water. Mr Walsh recalled yesterday how Mr McGrotty handed him the infant and might have saved himself but courageously returned inside the vehicle in a vain bid to help the rest of his family. At least three online crowd-funding pages have been set up to help Ms McGrotty and others family members bereaved by the tragedy. Local fundraisers are also underway. Derry-based Martin McGranaghan launched a JustGiving page on Monday saying financial worries should be "the last thing on (the) minds" of the bereaved families. His initial £5,000 Sterling target was surpassed within hours and now stands at almost £30,000 (almost 38,000 euro) with donations continuing to clock up. "Totally overwhelmed at the level of support everyone has showed to the Daniel, James and McGrotty (families). They are overwhelmed by the support they are being given at (this) heartbreaking time. Please keep them in your thoughts," he posted on the charity page. One woman called Laura donated £20 with the words: "Dear Louise, I wish I could do more for you. Please stay strong and try to find love and happiness in your life through your wonderful daughter. Some day you will. Sincerely sorry for your loss." Meanwhile, a JustGiving page set up by young Buncrana mum Michelle Black now stands at £11,000 (almost 14,000 euro). Michelle has also opened a Buncrana Credit Union account to help the affected families. "There (are) no words we can say or anything we can do to change what happened. But what we can do is help show our support to the family of the victims," said Ms Black. Funerals for the five victims will take place at Holy Family Church, Ballymagroarty on Thursday. For obituary notice click here .